I would be willing to bet that most of us live life day to day without giving one thought about our digestion and its effect on our health. Am I right? Our digestive system is probably one of the most important functions keeping us in tip top shape. The digestive system plays a critical role in our health and we really need to take care of it. 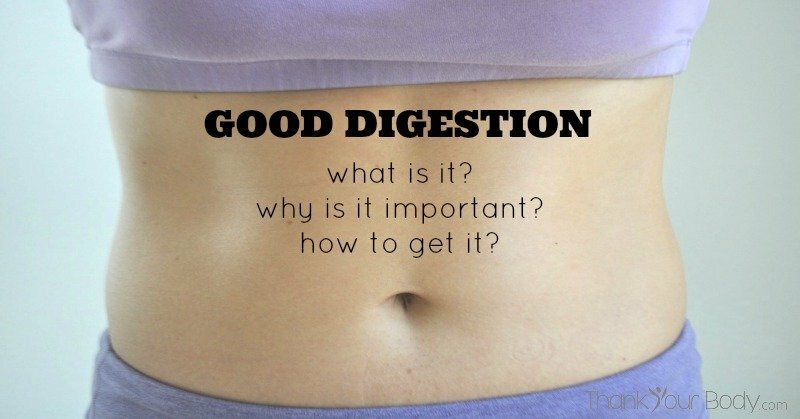 What exactly is good digestion? In our mouth, our teeth tares and chops the food. Our saliva contains enzymes which start the breakdown of some of the carbohydrates and acts to moisten the contents for easier swallowing. While in the stomach food turns around in enzymes and gastric acid. The acid activates pepsin which breaks down protein and kills most living things, like bacteria. The small intestine is where most of the nutrient absorption begins and enzymes are still helping to breakdown food. The large intestine contains the highest level of bacteria on earth and helps digest the remaining food. Fatty acids are some of the by-product of digestion which provides energy to our intestinal cells. Trillions of bacteria are living in our guts, in fact we have more bacteria than cells. These bacteria are critical to proper digestion. So why is good digestion so important? We now know what Hippocrates had meant so many years ago that, “All disease begins in the gut.” The growing research on our micro biome shows that having too few bacteria (in quantity and variety) can not only effect digestion but can cause things like cancer, diabetes, heart disease, autism, depression, and obesity. Many years ago these diseases were rare but now they are becoming more and more common. It is believed that our American diet is partially to blame. The typical diet now consists of highly processed foods: refined flour, white sugar, and animal protein (from milk and meat) loaded with antibiotics. These foods are not only low in nutrients, but low in fiber. It is the foods that we eat and the foods that we are not eating that are causing our guts to lack the microbes needed for proper digestion and disease prevention. Even in situations where you feel like you are eating loads of nutrients; an unbalanced gut flora can mean you are not absorbing all the nutrients your body needs. Americans have less gut microbes, and yet are sicker, than other populations studied. Other lifestyle factors that may prevent proper digestion are use of oral antibiotics, chronic stress, lack of sleep, nutrient deficiencies (well fed but undernourished), certain medication, food allergies, and infections. The good news is that we can turn some of this damage around (and quite quickly). Eat a variety of fiber (40-60 grams/day). Different microbes like to feed on different fibers. Avoid unnecessary Antibiotics. Speak with your doctor to find out how necessary taking an antibiotic is for your situation. Eat Fermented Foods. Raw sauerkraut, kimchi, kefir, kombucha, miso, tempeh, and beet kavas all contain large numbers of probiotic bacteria. Probiotics are an option. If you are on a budget eating the fermented foods above are your best bet. The potential problem with a probiotic supplement is that the dosage is hard to determine. Things like manufacturing, shelf life, and the affect our acidic stomach has on the bacteria is hard to determine. How many beneficial bacteria are actually reaching your colon? A probiotic, however, may be better than nothing. So the next time you sit down for a meal think about how your lifestyle is affecting your digestion. My name is Sara Korzeniewski and I have been a Registered Dietitian since 2003. I am a wife, cook, writer, fitness lover, blogger, and holistic nutrition enthusiast. I grew up near Chicago, Illinois and moved to warmer Arizona in 2011. I started my dietetic career in a traditional clinical setting teaching low fat diets to cardiac patients. In 2011, I wised up and realized that the answer to healthful living was real, whole foods. I started a blog in 2013, The Organic Dietitian (www.theorganicdietitian.com), in hopes of educating the public and achieving my dream of working full time in holistic dietetics.